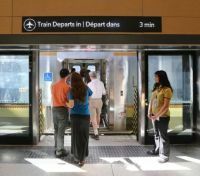 The eagerly awaited rail link between Toronto’s Union Station and Pearson International Airport has finally opened. And not before time. Pearson is facing increasingly strong competition from Billy Bishop, the downtown airport on the waterfront. An under-water walkway is due to open in late July which will save the short boat ride and resident airline Porter has announced its 22nd route, to Pittsburgh, starting 21 September. BTN’s Andrew Sharp was invited to the Toronto Express inaugural. He is a former Director of the International Air Rail Organisation (IARO). Let us hope this piece is read by Crossrail, Heathrow Express, Transport for London (TfL) and the Department for Transport (DfT). They might get some ideas. The world’s newest airport railway has opened. This is Canada’s Union – Pearson Express (UP Express), running every 15 minutes between Toronto’s Pearson Airport and Union Station. The ride takes 25 minutes with two intermediate stops. The service runs 19½ hours a day, seven days a week. The trains are smooth, comfortable, and look good – the colour scheme is calm and subdued. They have wi-fi. Like Heathrow Express, the airport is reached by a spur from one of the commuter and freight lines radiating from the city. Views, especially at the airport end, are spectacular: the line leaps over the highway network north of the airport on a 3000-metre viaduct which reaches 28 metres above ground level. The service has some excellent design features. The overhead luggage racks are actually bins, like on an aircraft. 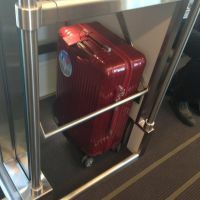 The stacks, for big luggage, have retaining bars which have to be lifted to slide bags in and then let down to stop them falling out onto the gangway. Both, apparently, were at the insistence of the government. The terminal stations have platform screen doors: the doors on the platforms have guards to prevent people from getting – accidentally or otherwise – between train and screen. Announcements are bilingual (this is Canada): ticket machines take US as well as Canadian dollars (giving notes in change – although I am not sure if the change is multi-currency too). At Union Station, there is a flight information display: there are self-service check-in machines which will also print bag tags. There is a dedicated ticket office as well as ticket machines. There are small retail outlets (cafe, souvenirs) at the UP Express terminal at Pearson, and a business lounge is to open in a matter of months. The UP Express area at Union Station has been criticised as being a bit remote from the main station – 7 minutes’ walk from the subway, for example – but it is on the Skywalk between the station and the Convention Centre and the CN Tower. Roads lead north from this to the western end of the city centre, while the main station is the jumping-off point for the financial district. Toronto is a walkable city – even in winter, with its PATH network of underground passages connecting major buildings in the city core. Another nice touch is that the information display on the train (in the ‘to airport’ direction) gives a list of those flights with delayed departures. As well as screens at the stations showing the minutes to the next two departures, there is a display above the platform screen doors to show minutes to departure. As departure time approaches, this changes to ‘Departure imminent: please board’ with airport style wig-wag lights! Signage at the airport is good, managing, at the decision point, to communicate the difference between the inter-terminal shuttle (a Birmingham Airport style cable-hauled train) and the train to the city. Both stop in the same general area in Terminal 1, so passengers between the city and Terminal 3 can easily change between train and shuttle. 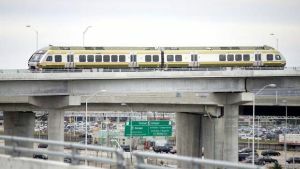 The concept has been around since the late 1990s: initially it was to be privately operated, but this proved not to be financially viable so it is provided by Metrolinx, the regional transit authority. Construction started in July 2012 and was completed by the end of 2014. The idea was always to have it open in time for the 2015 Pan Am Games (July-26). They made it! 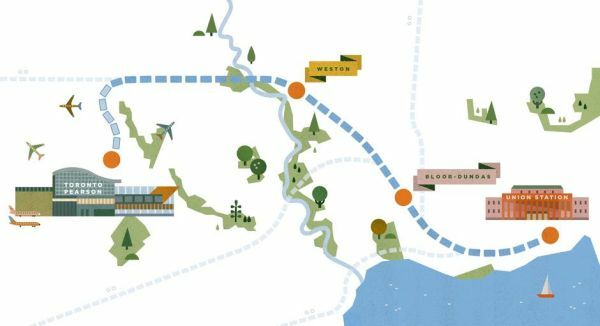 Public forecasts are that the line will attract 8% of Pearson’s passengers, but this seems low – an average for similar premium Airport Expresses is around 20%. Usage is expected to be 40% Canadian, 30% US and 30% rest of world. People living along the route – which until now has had infrequent freight trains and commuter trains mainly in the rush hours – objected to the addition of eight trains an hour, 19½ hours a day, especially because at the moment they are diesel powered. The six Sumitomo diesel units use low-emission engines compliant with EPA Tier 4 standards and are designed to be converted to electric traction at some point – probably within the next 8-10 years, as part of the Regional Express Rail project. The fare level too has been contentious. One way fare is C$27.50 (£14.40), but this comes down to C$19 (£9.95) with a Presto card – the local equivalent of the Oyster Card. A similar journey on GO Transit, the local commuter system, would cost C$7.20 (£3.77). A family (two adults and up to three children) pay C$55 one way: there are discounts for seniors and children. Airport staff get a discount of about 50%. It is understood that Pearson Airport is charging UP Express about C$2/passenger, supposedly in compensation for the loss of parking revenue. Great review, objective and from a crdible reporter. I\'ll keeo using TCC airport to Montreal, though, as its convenience on short haul flights is unbeatable.